Glueing the leather on the top part of the case went far easier than the bottom half, guess I'm getting the hang of it now. 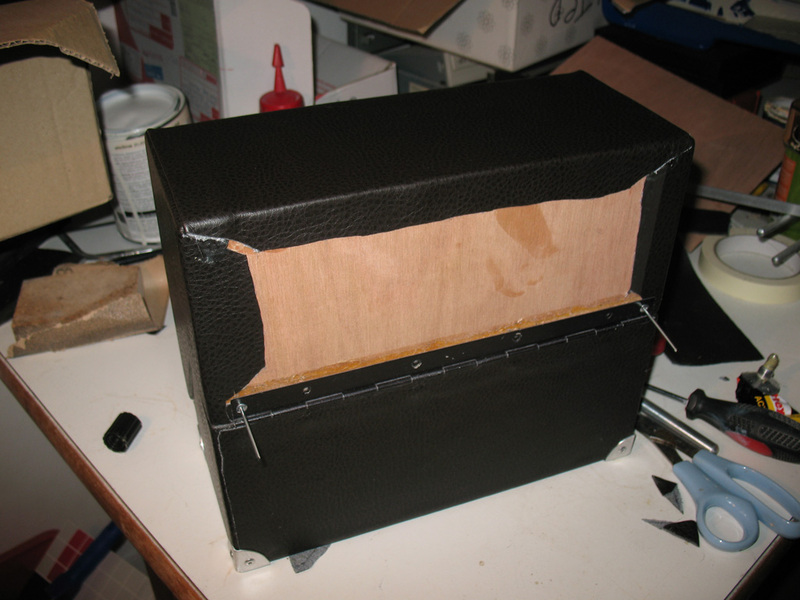 What is still quite hard to figure out, is how you cover the leather over your part in the least amount of pieces. You want it to look smooth around the corners without separate pieces of leather being glued on top of eachother. It should be possible to do the whole half with one piece of leather but I haven't, partly cause my piece of leather wasn't large enough, so keep that in mind. As a result of this I have to glue a separate piece of leather that will cover the back. As it's the back it's not that big of a deal but I wish I had planned a little bit better. Well, next time will use what I have learnt. So this is what I have now, bottom and top and ready to join them together. I will join the two parts first before I cover the back with leather and hide those rivets. While that was drying I started on the last 4 corner protectors, I have 2 done at this point as I'm writing this. I haven't got an idea yet how to fix a handle on top or what to make it from. And of course the inside needs to be covered with fabric. 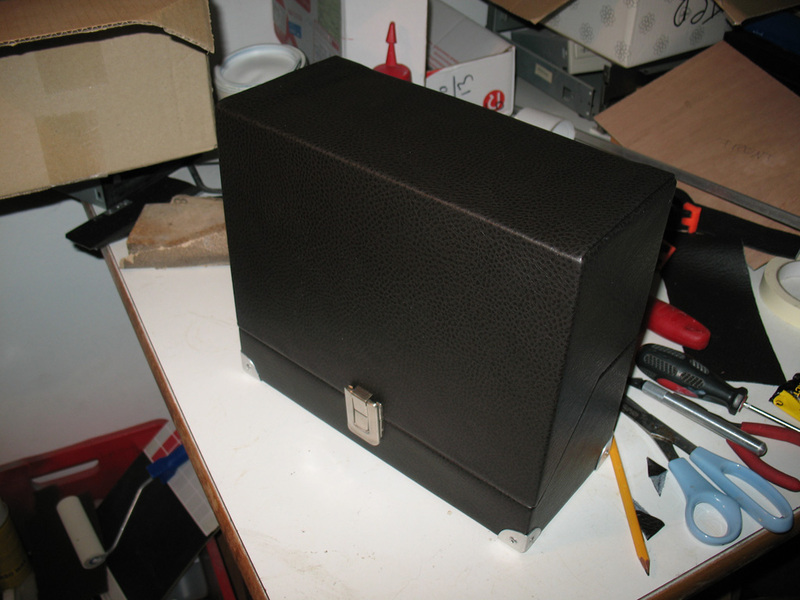 After all that is done I will need to construct some boxes that will fit inside the case. 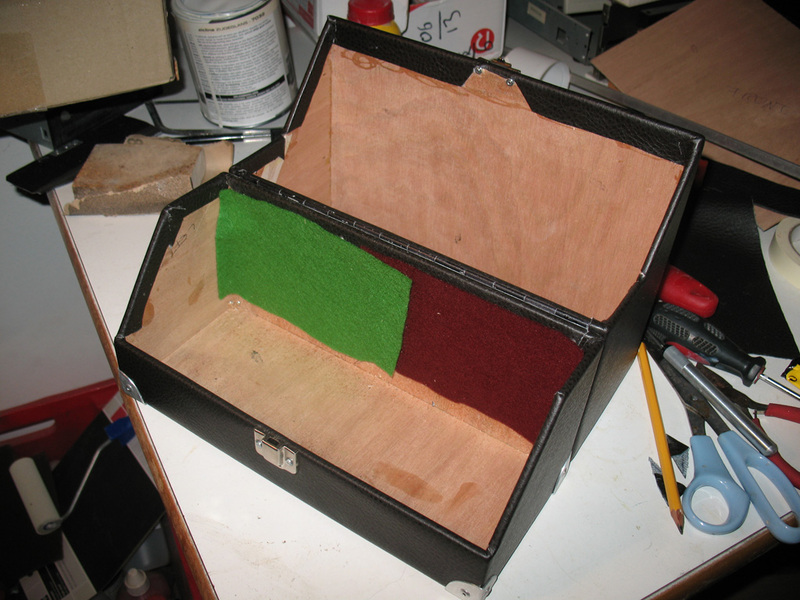 I was thinking of making 3 open boxes that stack on top of eachother, maybe cover those in red leather for a classy look. But for now I leave you with a view of the inside and 2 pieces of felt that will cover the entire inside of the case, I think I will go for the red one.